To get to visit the workshop-gallery of an artist whose work we have admired from our first stay in Castelnaudary. His name is Jean Luc Lafitte but his artistic name is Lu. Art is subjective, as is taste. We first saw Lu’s work in our favourite restaurant. As we go there most weeks, we have had plenty of opportunity to look at his work. They are the sort of canvases in which people see different things. They are also have texture. I always want to touch them. This is because the paint is applied with a spatula, trowel or whatever else might come to hand. The gallery is in a village on the way to Carcassonne. Jean Luc recently moved into his new premises and is still at the organisation stage, as you can see from my photos! He is a larger than life character. We took to him immediately. He runs workshops too, including some for children with special needs and adults with disabilities. It took us ages to decide which canvas to purchase. And here it is! We bought it back to the UK and whenever we look at it, we have a reminder of our French home. It’s certainly very different from our more traditional Canal du Midi photograph or Eric Ravilious print. 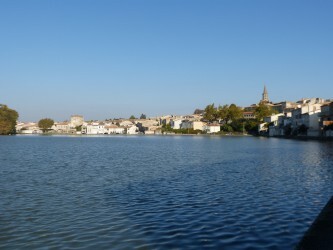 I am linking up with the very brilliant #AllAboutFrance. 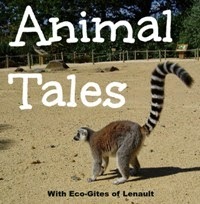 If you want to read a wide variety of posts, all with a French theme, do have a look here! June, I love it! I saw the unicorn and think I saw a few other creatures. A shark? A dragon? I’d love to see his work. Thanks for introducing him. Let me know if I’m delusional! Not at all – I can see them as well! That is a great buy – I really like it! Interesting… I am not really into that sort of art, but I love this man’s work! Mesmerising! Thank you for commenting & I’m so glad you like this piece of art. You’re spot on; it is mesmerising. Wow! Love the colours. I think the first one you feature is my favourite. I agree the first one is fabulous. That was taken from the website of the artist. The others were taken with my phone; vive la difference! Not only a great artist but he sounds like a lovely person, running all those workshops too. 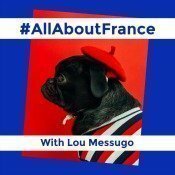 Thanks for linking to #AllAboutFrance (it only took me 2 moths to comment!!! ), back again tomorrow, hope you can join in again.